Myers International Midways will not be touring during the 2014 season. The show will still provide rides independently on a number of major midways next year. More details to follow. Frank Zaitshik informed Carnival Magazine that Wade Shows will take delivery of a third large roller coaster to premier on their midway in 2014. The 10 trailer Wildcat Coaster will be themed Comet II and measures 215-feet long by 75-feet deep. The piece joins two other large roller coasters in the Wade Shows ride inventory. It is set to premier at next year’s Florida State Fair. The show will also premier a Huss Rainbow next year at the South Florida Fair in West Palm Beach, FL. Congratulations to Nick Elliott and his new wife, Kasey. The couple was married on Saturday, November 9. During the season the couple travels with Elliott’s Amusements in Michigan. Nick serves as ride manager on his family’s show and Kasey is the concessions manager. Food concession manager and customer service representative, Nate Rowe, was best man at the wedding. Nick’s mother, Debbie Elliott, informed carnival magazine that 2013 was a good year for the show. They have acquired a couple of new events for next year and the show is currently looking at a couple of new ride purchases. A tragic ride accident involving Josh Macaroni of Family Attractions’ Technical Park Vortex received national media attention while at the North Carolina State Fair. Five individuals were injured when the ride improperly started while riders were exiting it. The ride remains on location at the North Carolina State Fair while the investigation is carried out and more facts about the incident are determined. Father John Vakulskas Jr. is organizing a Pilgrimage to Italy scheduled for February 18 – 28, 2014. The journey will include daily Mass and Papal Audience. A number of sightseeing destinations across Italy are also included with stops in Venice, Ostiglia, Florence, and Assisi as well as Rome. For more information, visit www.carnivalpriest.com or contact Father John directly at (712) 490-8047. A recent film entitled “ZIPPER: Coney Island’s Last Wild Ride” was featured in the schedule at the 11th Annual Tallgrass Film Festival in Wichita, Kansas. According to a press release from Chance Rides: “The film is an homage to one of Chance Rides most thrilling and well known carnival rides…the film is written and directed by Amy Nicholson.” The ride manufacturer proudly acted as presenting sponsor for the film. James E. Strates Shows has been named as the new midway provider for the Lee Regional Fair in Sanford, North Carolina. Playworld Amusements was the previous midway provider. In 2014, the Lee Regional Fair will operate from September 10 through 15. Billy Clark of Smokey Mountain Amusements has announced that the show will be operating one unit instead of two beginning with the 2014 season. Smokey Mountain Amusements is based in Robbinsville, North Carolina. The Nevada State Fair will return for the first time since it was canceled in 2011. The re-launch of the Nevada State Fair comes as the state celebrates its 150th birthday in 2014. The event will take place in Carson City and is scheduled for July 30 through August 3. More details to come. The Arizona State Fair, which began on Friday, October 11 and concluded on Sunday, November 3, reports that over 98,000 fairgoers attended this year’s event. The figure is up 23,000 higher than last year. The fair is closed on Mondays and Tuesdays during its run. Ray Cammack Shows is the midway provider and offered several new rides including the Chance Freestyle, KMG Insanity, Mach 1, and four new kiddie rides. Arnold’s Amusements has purchased a Mulligan Giant Wheel from Playworld Amusements. The show is also in the process of adding LED lighting to their Eyerly Roll-O-Plane. North American Midway Entertainment has signed a four-year contract with the Miami-Dade County Youth Fair in Florida. The show has been the event’s midway provider for many years and the large event is a kick-off location for N.A.M.E.’s season. The 2014 Miami-Dade Youth Fair runs from March 13 through 30. The show has also extended their contract with the South Carolina State Fair for three years. Attendance at the State Fair of Virginia increased 40% in 2013 compared to the year prior. The ten-day event ran from September 27 through October 6. A total of 229,000 fairgoers visited the event this year. This was the first time that the Farm Bureau Federation operated the event independent of a partner. Deggeller Attractions provides the midway at the State Fair of Virginia. Carnival Magazine extends its sympathies to Pat Repp of N.A.M.E. and his wife Kristin, on the passing of their son, Matthew S. Repp. Matthew passed away on October 8, 2013 at his home in Kirkwood, IL at the age of 28. Carnival Magazine has learned of the recent passing of John J. Fanelli, founder of Fanelli Amusement Co. based in Greenville, New Hampshire. John passed away on April 3 at the age of 77. John got his start in the industry with a scratch-built popcorn trailer and in 1956 formed Fanelli Amusement Co. You may view John’s obituary here: click here. Carnival Magazine offers its deepest sympathies to John’s friends, family, and everyone at Fanelli Amusement Co. The New York State Fair in Syracuse concluded on Monday, September 2 after greeting a little over 851,000 fairgoers. The number beat last year’s attendance figure of 845,000. The fair ran from Thursday, August 22 through Labor Day. James E. Strates Shows provided the midway. While much of the 2013 Minnesota State Fair was affected by unseasonable high heat, the event and its independent midway welcomed cooler temperatures to close out the event. A new single-day attendance record was set on Sunday, September 1 with 236,197 fairgoers on the grounds. Temperatures reached as high as 100 degrees during this year’s fair with heat indexes well above 100 degrees. The event ran from August 22 through September 2. Gold Star Amusements recorded a 5.5% increase in midway gross at the 2013 Steele County Free Fair in Owatonna, Minnesota. A total of 350,899 people attended the fair, which ran from August 13 through 18. The attendance number reflects a 9% increase from 2012. Top grossing rides at the fair were led by Gold Star Amusement’s Century Wheel followed by the Freak Out, Alpine Bobs, Muzik Express, Carousel, Zipper, and Re-Mix II. Next year’s Steele County Free Fair will run from August 12 through 17. Reithoffer Shows has re-signed the West Virginia State Fair for an additional three years. The show has provided the event’s midway since 1990. Wet weather affected attendance at this year’s fair, which ran from August 9 through 17. This year marked the 89th year for the fair. The top-five grossing rides at the Wisconsin State Fair were led by Deggeller Attractions’ Rip Ride Roller Coaster followed by Wood Entertainment’s Area 51, Reithoffer Shows’ Sky Flyer, Sky Attractions’ Big Bamboo, and Blake’s Concessions Alpine Bobs. The 2013 Wisconsin State Fair recorded 1,012,552 visitors during the 11-day event. It was the highest attendance number since 1969 and beat last year’s numbers by 10%. Next year’s Wisconsin State Fair runs from July 31 through August 10. Frank Zaitshik’s Wade Shows provided the midway for the first time at this year’s Nebraska State Fair. The Grand Island event ran from August 23 through September 2. Despite very high temperatures, this year’s fair was still well attended and just shy of last year’s numbers. “The heat was certainly an issue for the first 9 days,” said Joseph McDermott of the Nebraska State Fair. “Happily, our total attendance came in at 334,931, which is just 2,056 visitors behind 2012.” Labor Day attendance beat last year’s numbers by 3,500. The fair also broke a single day record attendance number for its current grounds in Grand Island on Sunday, September 1 when 71,355 visitors attended the fair. A single day attendance record from the fair’s old home in Lincoln, set in 2009 with 71,627 visitors, just barely holds on to its title. The previous record at Grand Island was recorded in 2011 when 67,929 visitors attended on a single day. Next year’s Nebraska State Fair runs from August 22 through September 1. The Colorado State Fair in Pueblo concluded on Monday, September 2 with a slight increase in attendance compared to 2012. This year’s number hit 476,966 compared to 474,914 last year. The 141st Colorado State Fair began on Friday, August 23. The fair introduced a cashless system provided by Mobile Money. Crabtree Amusements provides the midway at the event and featured over 45 rides on the midway. New on the midway this year was a Hard Rock. A fire at the Charles County Fairgrounds in La Plata, Maryland occurred on April 2, damaging portions of the grounds and some property traveling on the Orange Unit of Reithoffer Shows; there were also reports that pets were lost in the fire. The fire was a result of larger brush fires in the area caused by high winds and dry weather. While all of the details are not yet in, on the company’s website, Reithoffer Shows asks for prayers and thoughts during this time. In other news from Reithoffer Shows, it has been announced that the carnival company will take delivery of a new, A.R.M. Vertigo this April. Corky Powers of Powers Great American Midways reports that the show has purchased a new Wisdom Rampage. The new piece is scheduled for delivery at the 2013 North Carolina State Fair and is the first completely new Rampage being built by Wisdom since the ride manufacturer began offering the piece again this year. PGAM has also purchased a new shop trailer and 7 new tractor trailers including International and Freightliner models. C.D.A.C. Inc. of Peoria, IL reports that they have purchased a Fabbri Gondola Wheel for 2013 through UsedRides.com. The Virginia Farm Bureau has taken full ownership of the Virginia State Fair. The organization had been 50 – 50 partners of the fair with Universal Fairs since July of 2012. The fair moved through bankruptcy in recent years and was purchased by Universal Fairs earlier in 2012. North Star Amusements has acquired the contract for the Western Montana Fair in Missoula, Montana. This year will mark the first of a three-year contract. North Star is set to provide at least 30 rides including a minimum of 5 spectacular pieces. The show is owned by Bret McKenney. The Western Montana Fair midway had been provided by Royal West Amusements and Inland Empire Shows. This year’s fair will run from August 6 – 11. Lloyd Serfass of LAM Enterprises reports that all crucial festivals and fairs along their route have been renewed for 2013. The show has taken delivery of a used Dragon Wagon and is currently preparing it for the season in their shop. Last year the show completely overhauled an Aladin for their midway. 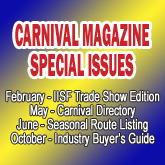 Lloyd also told Carnival Magazine contributor Dennis Gilli that last season was good for the show and they are hoping for a great 2013. Chairman of the Greater Baton Rouge State Fair, Cliff Barton, informed Carnival Magazine that the event has signed a contract with a new midway provider for this year. Mitchell Brothers Amusements of Slidell, Louisiana has become the event’s new midway provider. “We are looking forward to a new look and exciting new rides,” stated Cliff Barton. The fair donates its profits to charitable and nonprofit organizations focused on helping families and children. “We began this program in 1987 and have now passed the 2.5 million dollar mark,” reported Cliff. This year’s fair runs from October 24 – November 3. The Mondial Space Roller once owned by Jane Baxter has been purchased by Jeremy Floyd. The rare, European ride was last owned by Walter Murphy. During the 2012 season it traveled to many midways as a booked in piece. Among the events where it appeared was the Ohio State Fair, New York State Fair, and North Carolina State Fair. Now owned by Jeremy, the ride will be refurbished and continue to be booked independently. Congratulations to Leah O’Neil of O’Neil Amusements who was announced as the incoming President of the Midwest Showmen’s Association. O’Neil Amusements is based in St. Paul, Minnesota. The independent midway of the Florida State Fair recorded a ride gross of $4,250,000 during the February 7 – 18 event. Attendance reached 442,000 fairgoers. Read more about the 2013 Florida State Fair in this month’s article on the event. In a press release from the Outdoor Amusement Business Association, the OABA board voted to advance officers Mike Featherston, to 2013 Chairman; Chris Lopez to First Vice Chair and Michael Wood to Second Vice Chair, their next level of leadership. In addition, Tom Gaylin, who has served as a director since 2008, has been elected as Third Vice Chair. Continuing as Treasurer, Dan Kroeger was re-elected by the Board to fulfill his duties as the Association’s financial officer. Jeff and Patti Blomsness of North American Midway Entertainment are the proud grandparents of newborn Victor Paul Rieder. Kristina and Etienne Reider announced the birth of their new son on February 11. Kristina is Jeff and Patti’s daughter. Victor was born weighing 6 pounds, 13 ounces and measuring 21 inches. Estelle T. Bell passed away earlier this year on January 14. Estelle was a longtime member of the amusement industry and was involved for many years with the Miami Showman’s Association where she served as Past President. Jon Luehrs Sr. passed away on March 15. Jon was a lifetime member of the St. Louis chapter of the Showmen’s League of America and a member of OABA. Jon grew up in the industry and was part of the family business at Luehrs Ideal Rides. Industry legend Jack Honeycutt passed away on March 26. Jack was a member of the industry for many years fulfilling roles with Hennis Shows, Olson Shows, Strates Shows, Link Shows, and most recently Wade Shows. Jack joined the carnival industry at the age of 15 and served as a trainmaster during his time on the road. Jack was well-known in the industry as Top Brass, a nickname that he received as a result of his time on the Chicago Police Force when he carried brass knuckles. Jack was featured in the July 2001 issue of Carnival Magazine and he appeared many times throughout the magazine’s story on railroad shows. Steve Mains, President of the Hickory American Legion Fair in Newton, North Carolina passed away Friday, February 1. Steve was 65 and born on August 5, 1947. As stated in his obituary, Steve was a 42-year member of American Legion Post 48. As President of the Hickory American Legion Fair he oversaw the annual event with midway provided by Drew Expositions. He also served as past president of the NC Fair Association. Survivors include his wife, Linda Mains; a daughter, Alyson Mains and fiance', David Bruce, and her son, Trace McCoy; a stepdaughter, Jennifer De La Jara and husband, Jorge, and their children, Julian and Sofia; his stepmother, Thelma Mains; a sister, Sebrina Mains; a granddaughter, Courtney Ellington; a great-grandson, Marley Fischer. All at Carnival Magazine express our deepest condolences for Steve’s family, friends, and associates at the Hickory American legion Fair.